Born 15.11.1906 Second son and fourth child of Dr E W Skinner and Isobel Katharine Freeman of Mountsfield House, Rye. Educated at Hurst Court Preparatory School, St Helens, Ore, Sussex from where he gained an exhibition to Tonbridge School. In 1922 he went To Royal Naval College, Osborne and he was gazetted Paymaster Cadet in HMS Thunderer in 1924. From May 1925 he served in HMS Marlborough and HMS Delhi. He was promoted Paymaster sub-Lt 1927, Pmr Lt 1929 and Pmr Lt-Comd 1937. From April 1929 asst sec to Admiral Sir Howard Kelly, then 2 i/c Mediterranean and in 1931 accopmpanied him to China. 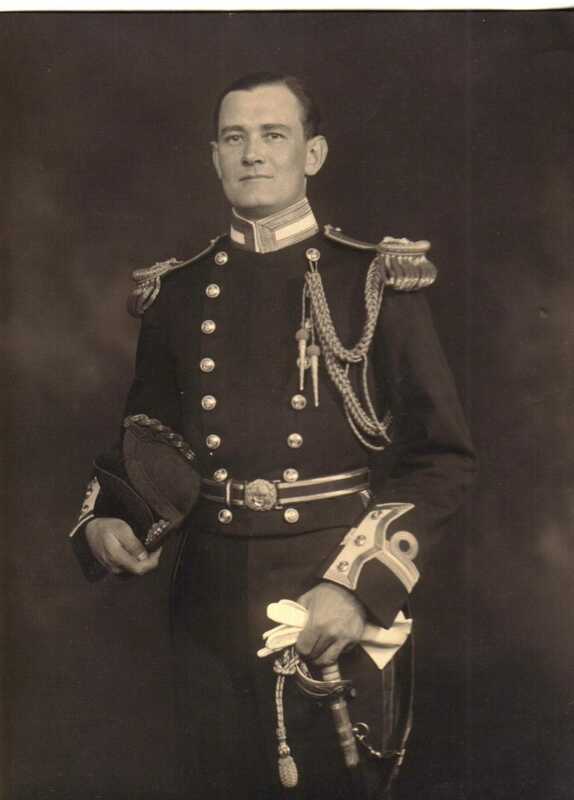 Became first Sec to Chief of staff, Vice Admiral Sir Geoffrey Layton, before being posted to the staff at RNC Dartmouth 1933-34. This was followed by another spell as Secretary to Admiral Layton at Portsmouth before being posted to HMS Frobisher in 1935. 1937 Assistant to Resident Naval Officer, Shanghai. He earned an extra shilling a day as interpreter in French and Italian. In 1936 he married Catherine Edith Mary MacDonald in London and a son, David, was born in May 1938. His parents gave them a car for a wedding present and they had a honeymoon touring in Scotland. They rented a house at Camber during his brief spell back in England, during which time the newlyweds toured in the Black Forest in Germany accompanied by Cathy’s brother Colin. He was a keen and accomplished golfer and interested in the Navy and the history of the Cinque Ports and the South Coast. He wrote a thesis on Rye’s place in Naval History and on Caesar’s landing at Pevensey. On 24 May 1940 he joined HMS Dunedin in Bermuda after having taken passge to Bermuda in HMS Aurania. Dunedin was posted to the West Indies station protecting Bermuda and the West Indies and intercepting contraband cargoes. Even as his wife and son were in convoy to Bermuda, Dunedin was ordered to the South Atlantic squadron based on Freetown in Sierra Leone. He died a week after his 35th Birthday when Dunedin was torpedoed on 24.11.41.